On February 4 Herriman takes one more swipe at the city council, then takes a few well-deserved days off. 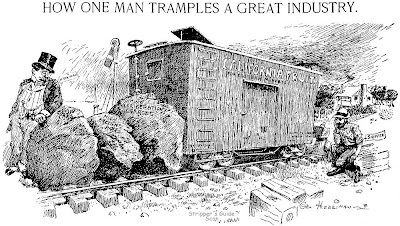 He returns with the railroads suddenly the biggest bee in his bonnet. 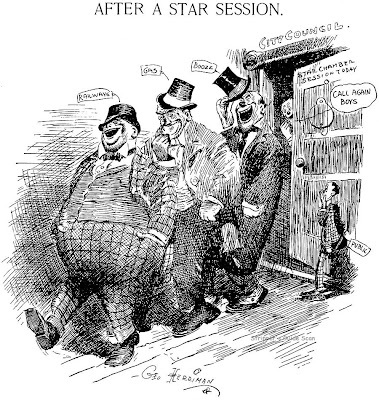 His cartoons on th 7th, 8th and 9th all feature Harriman and the business practices that have finally brought him to the attention of the Interstate Commerce Commission. 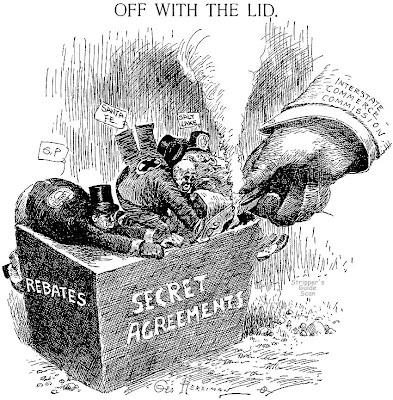 Unfortunately the cartoons of the 8th and 9th are apparently both done under deadline pressure, Herriman's style degrading to flat caricatures and awkward staging. On Sunday the 10th Herriman contributes two giant full page-width cartoons, one each for the sports and automobile sections of the paper. 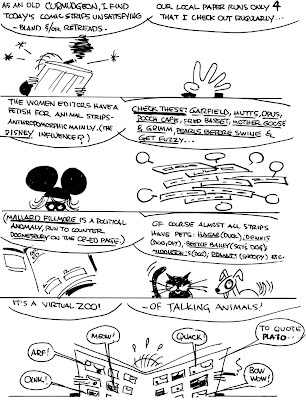 Since we were discussing Boody Rogers yesterday here's a Funnies strip he did take credit for, Deadwood Gulch. This strip even got the reprint book treatment by Dell, though good luck finding a copy. Hen's teeth are plentiful by comparison. Sorry about the missing panel! Must have been a real corker for that rotten kid to have so carefully cut it out. 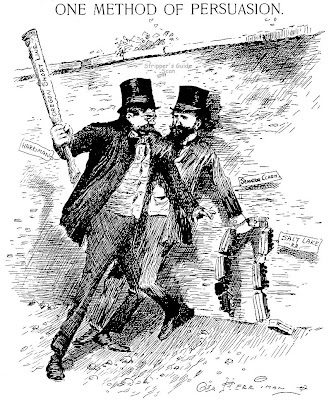 Here's Sancho and the Don by Ralph Wolfe. It sometimes appeared in the section as a color page, in my issue it's a half-tab black and white. Wolfe was a good cartoonist and storyteller -- he had a knack for coming up with good strip ideas. Unfortunately he also had a knack for picking out bad companies to work for. In addition to this Dell project he also worked for the Graphic Syndicate and Cornelius Vanderbilt's C-V Syndicate. I understand he finally managed to pick a winner when he went to Warner Brothers, working in their animation studio. Hello, Allan---Is it possible that this was actually drawn by Gordon "Boody" Rogers? It certainly looks like his style, shading, and lettering. Even the initials "RG" ("Rogers Gordon"?) look like his signature. -----Cole Johnson. It certainly could since Rogers was involved with The Funnies. His (signed) strip will be shown here anon. I can see elements of both Wolfe's and Roger's styles here -- maybe Boody inked Wolfe's pencils or something to that effect? 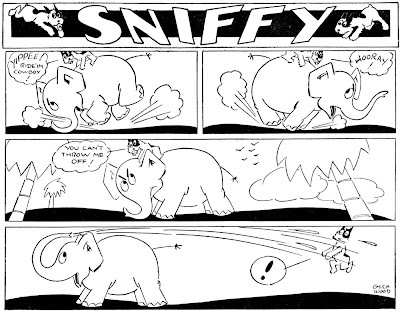 Here's a strip from one of the black and white pages of The Funnies, Sniffy by Glen Wood. Not much of a gag, but this Wood fellow had a pleasant style. Except I think there is no such person -- looks suspiciously like VEP's work to me. Let's talk a bit more about the newspaper question. The really odd thing about The Funnies is that most of its features were listed in the Editor & Publisher syndicate directory. If it was a standalone newsstand publication what were its features doing in there? And if the section ended in late 1930 why were many of the features advertised in E&P until 1934? And why were all those features listed as being syndicated by Eastern Color Printing, rather than Dell Publishing? Here's my guess -- after the initial run, which was tried both as a newsstand publication and was also eventually offered as a newspaper insert, Dell deep-sixed the publication, but had a lot of paid-for material on its hands. So they tried publishing some Cupples & Leon style books of Clancy The Cop and others, but those didn't sell either. So they figured maybe they could make the experiment pay off by offering the strips as separate features to newspapers for their existing Sunday sections. 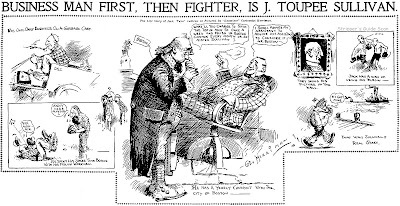 They offered the strips through Eastern Color Printing, a company with which they did a number of joint ventures, and which was a major printer of Sunday funnies for newspapers. Only problem was no newspapers bought the darn features! Not surprising because Eastern was not in the business of marketing comic strips to newspaper editors, though one must imagine that they should have had quite a leg up on the competition. End of utterly baseless speculation. EDIT 8/7/08: Chris Mosher writes to tell me that VEP lived on Glenwood Road in Flatbush, so that explains the pen name. You can find a bio of VEP by Mosher here. this will be short as a nice long post, I tried to post got sent to the void: All I can see, shows that Eastern Color produced the material and Dell handled the newstand aspects of publishing. Eastern Color even ran Seaweed Sam (hope i recall the name right) in later years in FAMOUS FUNNIES. I haven't seen this Seaweed Sam in any of the sections. I guess what has me scratching my noggin is that Eastern Color never managed to sell any newspapers on running this reasonably good material. Apparently they were trying to sell it for four years -- could they really have had such a complete lack of success over such a long period? My fantasy, I guess, is that someone will come out of the woodwork to tell us that, "oh sure, those strips all ran in the Foggy Bottom Daily Windbag". A fella can dream, right? Hmm. The first post about The Funnies yesterday was greeted with the deafening roar of virtual cricket chirpings. No one has any information to share? Well, anyway, here's our first strip from The Funnies. Jimmy Jams was by VEP (Victor Pazimino), who did anchor duty at that publication. He provided every cover that I've seen, always featuring Jimmy in one of his eponymous jams. I suspect that Jimmy appeared in every issue and was featured on every cover. As you can see, the sample above was treated rudely by some young rapscallion 75+ years ago. EDIT: I forgot to mention that Jimmy Jams, prior to this incarnation, was a Central Press daily panel in the late 20s. I have nothing to offer but support... this should be interesting! Today we're going to start on a series of posts about a very rare series. Dell Publishing, for reasons long lost to the mists of time, decided in 1930 to begin publishing a tabloid called The Funnies. 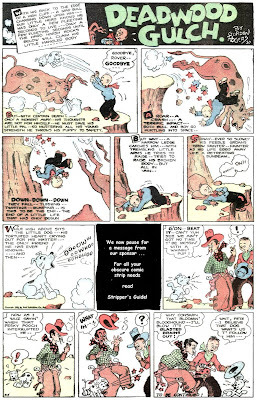 The 16 page publication was on newsprint throughout, including the cover, and featured comics, stories and columns. All the material was original to the publication. The series lasted for at least 36 issues. 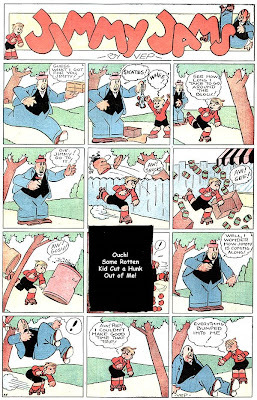 Based on the numbering cited in Robert Beerbohm's platinum age comics section of the Overstreet Price Guide that places the first issue appearing on February 15 1930, and he has the last known issue, number 36, on October 18. 1) I corresponded with Beerbohm many years ago about the series -- unfortunately the correspondence was long ago lost but my best recollection is that he claimed his samples at the time all came from the microfilm of a newspaper in Quebec Canada. 2) The comic strips from the publication were offered in the Editor & Publisher Syndicate Yearbook. More on this in a subsequent post. 3) Beerbohm's samples (he made a batch of photocopies for me) had the cover price blanked out, which would be appropriate for an insert. 1) Some samples of the tabloid, including mine, have prices printed on them. 2) It is cited as a newsstand publication by Beerbohm and others. I don't know what the basis for that is other than the cover price. My guess is that Dell was probably trying to market it both ways. But part of the reason I'm doing this series of posts is to try to gather more information from you comics scholars out there. Surely there is more known about this publication now than there was a decade or so ago when I talked to Robert Beerbohm about it. Has anyone else found samples, either accompanying newspapers or otherwise? The rest of this series of posts will reproduce samples of the features from The Funnies from my lone sample -- a find that I've been searching out for years now. Unfortunately my sample is missing 4 pages and there's a cutout on the back cover. But beggars can't be choosers, so I'm happy to have even this badly damaged copy. 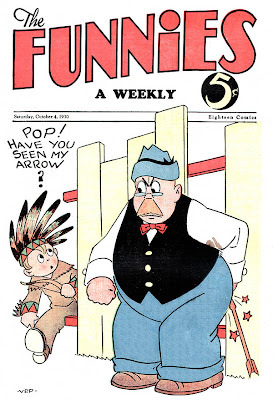 Hello, Allan---I also have a copy of THE FUNNIES, namely #10, September, 1929,24 pages. It has a circle printed in the masthead, with "10c" in it. Some pretty fascinating stuff in it, perhaps the most interesting is a brand-new PERCY AND FERDY series by H.A.MacGill.Could you use xeroxes from it? Actually, I thought this would be outside the realm of comic strips, and would be considered more of a very early comio book. It's clearly designed as a stand-alone publication. My two cents is that the Quebec newspaper business sounds like a Loch Ness monster sighting.---Cole Johnson. Says #10 on it, eh? Well that's shoots my timeline in the foot. Apparently the earlier issues were monthlies? Since yours just says September, that sure sounds like a monthly, so that would kill the idea that they were marketed as newspaper inserts, at least at first (I'll have more to say about that in my post tomorrow). My sample isn't numbered, so I'm leaning heavily on Overstreet here. Beerbohm's samples that he sent me had the prices blanked out, so they definitely exist in that form. Hopefully Robert will find his way over to the blog and weigh in on the subject. I lost his email long ago -- could someone who corresponds with him ask him to pay a visit? And what a question, Cole -- of course I'm chomping at the bit to get photocopies of your issue. Silly, silly fellow! check out the "Origin of the Modern Comic Book" article in the last few Overstreets wherein i credit Ken Barker for the Montreal Funnies discovery which placed THE FUNNIES as a newspaper insert in at least that city as well as your research re THE FUNNIES in Editor & Publisher 1930-34 as advertised therein by Eastern Color. Collectively comics fandom actually knows a lot about this start-up and how it ties into the later start-up FAMOUS FUNNIES which Dell and Eastern also partnered up on - nothing bizaare to me on this concept: a printer and a wholesaler joining forces during the Great Depression. Sorry, my last Overstreet is #36 at present. Since the only part of that tome that is of interest to me is your hall of wonders at the front, which may or may not have a lot of new information in a given year, I unclasp my purse only every three or four years for the latest version. As I said to Steven Rowe in a comment a few days hence, I'm hoping that since this Montreal (Gazette? Star?) paper ran the section that others, hopefully in the US, did as well. If they did I can add all these delightful strips to my Stripper's Guide project. Otherwise I'm bound by my self-imposed rules to ignore them, a shame since most of the creators were newspaper strip guys, some pretty important (like H.A. MacGill and 'Bunny' Schultze). So have you heard of any more discoveries re the section appearing as a newspaper insert? Oh, and you mentioning Ken Barker has me wondering. Did I miscredit you for sending those photocopies? Was it actually Ken? If so, Ken, please accept my apologies.